Take one of gamings most loved franchises: the Super Monkey Ball series, swap out the monkey for a Chicken McNugget (yes, really), add a fair share of McDonalds branding and you’re left with an incredibly enjoyable if not slightly surreal game. 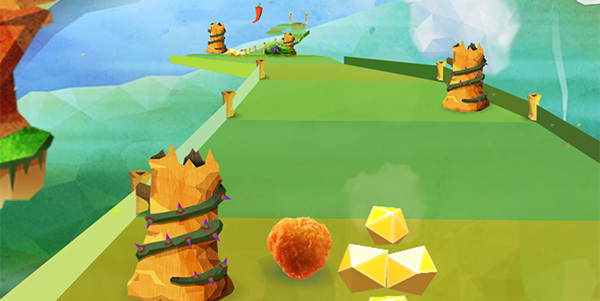 Created by http://www.goodboydigital.com/ for Razorfish as part of a new McDonald’s campaign the game involves rolling your McNugget down a set of winding, twisting, hair-pinned tracks across various environments. As you roll you collect items and can jump to bump into power-up chillis as well as avoiding the dangers on the road. The game runs at a beautifully fast pace, utilising pixi.js under the hood with a whole new set of custom render objects to handle the road. It works on mobile but is pushing the pedal to the metal, so cheap Android tablets will suffer under the strain, but it certainly played smoothly on our iPad and Nexus 7. It’s a really fine example of a global brand adopting an HTML5 game for a major promotion to hit as many platforms as possible. Play with your chicken balls on the Super Spice Dash site. This entry was posted in Game and tagged game, Goodboy Digital, mobile, Pixi.js by Richard Davey. (permalink). on Posted on October 18, 2013 by Richard Davey.